You’ve done the hard part and found the one. Time to pick out the perfect ring! Intimidated? Don’t be! Gem Gallerie has a talented team of experts to guide you. Before you do anything, you should decide on your budget. Forget the old “three months’ salary” adage and spend what feels right for you. You should not put yourself into debt for the ring so look at your finances and see what is reasonable for you to spend. Hopefully this guide will help you prioritize all the different elements. Colour, Cut, Clarity, and Carat. Colour – Colour of diamonds are rated on a scale of D – Z. This scale actually rates the diamond’s lack of colour, the less colour = the rarer the diamond. Cut – Cut refers to the diamond’s ability to reflect the light. Basically, how much it will sparkle. Clarity – Good clarity means that the diamond has less impurities, blemishes, etc. Carat – Carat weight determines the size of the diamond. And, if you are confused, Gem Gallerie has expert gemologists on site to help answer any of your questions and help describe what each gem has to offer you. Diamonds, Emeralds, Sapphires, oh my! The traditional choice for an engagement ring is, of course, a diamond. Diamonds are gorgeous, classic, and they have an inherent magical quality. But many people are choosing to go the non-traditional route and buy other gorgeous gemstones (If a sapphire is good enough for a princess, it’s good enough for me!). If you are having several stones set into the ring, you could also mix and match with a gemstone in the middle and two smaller diamonds on either side. Since diamonds are more traditional, they are usually more expensive, so buying a different stone like a sapphire or a ruby could save you money as well! Deciding on metal in which to set the ring has a huge impact on the overall look and feel of the ring. For a long time, white gold and platinum were the trendiest metals, but now other metals are coming into style. Yellow gold is making a comeback and rose gold is very popular right now. Once you know what stone you want, pick a metal that will compliment it. Think of your partner’s style (which we will touch on later…) and what they will want to wear. Gem Gallerie’s goldsmiths will be able to assist you in picking out the perfect metal to compliment your ring. The style of the ring recipient is paramount. If her lifestyle is very adventurous and she spends a lot of time hiking or backpacking, a big four-carat diamond with an encrusted band is probably not something that will fit into her everyday life. This is something she will wear on her hand everyday so you want it to compliment her existing style. Think of the jewelry she already owns. Does she wear exclusively white gold? That might be the way to go. If the word Custom translates to expensive for you, think again! Gem Gallerie works with you to create gorgeous custom pieces without the scary price tag. Custom rings are a nice way to get exactly what you want and ensure that she will love it. If you have an old family heirloom ring that you want to use but you know the style isn’t right, we can help! We will take the stones and gold from your ring but design it into a more modern piece, that way you can pass on the memories in a contemporary way. You do your research, go to the jeweler, pick the perfect ring and…. you have no idea what her ring size is. Try to find this out before-hand. Bring in a ring she already owns and the jeweler should be able to tell you what size she is. Or, try the ring on your own finger, remember where it sits on your finger and you can get it sized that way. The best thing to do to keep the ring safe is to have it insured. Add it to your home or renter’s insurance – that way if something ever happens, you’re covered! It’s not an exciting part of the process, but it is an important one if you want to make sure that ring lasts. Why would you ever want to propose with a faux ring? Well, there are actually a couple of really good reasons, depending on how you plan to propose. First, if you are going away on holidays and plan on proposing there, this is a great option. Leave the real ring at home and bring the faux one so that if it gets lost or stolen, it’s not a big deal. Same goes if you plan to propose somewhere where the ring may easily get lost. 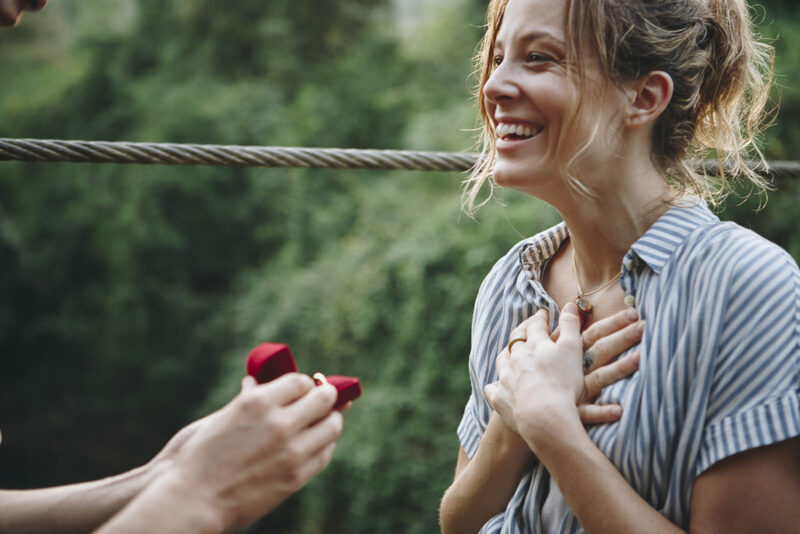 Like if you want to propose while canoeing, it may be safer to use a faux ring, lest it get knocked into the water in the excitement. Another reason faux rings are great is if you have no idea what she wants! You’ve read this list and you haven’t the slightest clue what she would like? Get a faux ring for the proposal and go pick out the perfect one together. This is a huge milestone in your life; don’t you want to get it right? A good jeweler will be able to guide you and tell you what to look for. At Gem Gallerie, we have graduate gemologists, master goldsmiths, and experienced jewelry professionals who know their stuff and can help you pick out the best quality ring for your budget. We also offer jewelry repair, cleanings, and appraisals. We can’t wait to help you pick out that perfect piece for the special moments in your life!